The Jackson Hole Weed Management Association (JHWMA) hosted the 19th Annual Cooperative Noxious Weed Spray Days (July 17-19, 2018). Volunteers came from all around Teton County and as far away as Idaho Falls to team up for invasive species weed control along the Gros Ventre River. Organized by Grand Teton National park and Teton County Weed and Pest District, the group targeted spotted knapweed, Dalmatian toadflax and perennial pepperweed (click on weeds to learn more about these invasive species) on public lands along the river corridor. The invasive weeds treated compete with native vegetation, adversely impacting wildlife habitat, and transforming ecosystem function. The first indication of knapweed on the Gros Ventre River is briefly discussed in minutes from a Weed and Pest District Board meeting in 1974, though the exact location is not mentioned. In 1999, JHWMA partners decided it was important to begin recording the presence of noxious weeds throughout Teton County. The Gros Ventre River from the Goosewing Ranch area to the confluence with the Snake River was surveyed as part of this effort. At that time, spotted knapweed was only located as far upstream as the Forest/Park boundary. No other infestations were identified upstream (east) of this location. This prompted the beginning of what is now known as the JHWMA’s Annual Gros Ventre River Spray Days project. In 2000, crews from Grand Teton National Park, the Bridger Teton National Forest, Teton County Weed and Pest, and the National Elk Refuge began targeting spotted knapweed along the river corridor in the hopes of reducing and containing the infestation and keeping the infestation from spreading further east into the Gros Ventre area. Despite these efforts, in 2001 spotted knapweed was found between the Forest/Park boundary and Lower Slide Like on the Gros Ventre Road. Then in 2008, it was found in the campground at Lower Slide Lake. This indicates that in addition to traveling downstream, knapweed is also traveling up the road with humans (vehicles, horses, snowmobiles, UTV’s, etc). 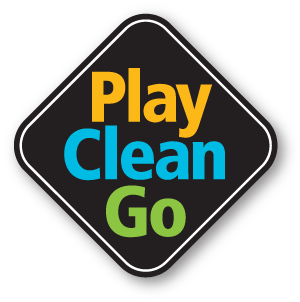 This movement highlights the importance of public awareness of how we can prevent the spread of invasive species to our favorite recreation areas by following PlayCleanGo (www.playcleango.org) principles. Gros Ventre River Spray Days continues to be integral to the protection of wildlife habitat in Grand Teton National Park and the National Elk Refuge. Unfortunately, the spotted knapweed infestation is so extensive in this corridor that it will never be eradicated. However, with careful planning and targeted treatments, JHWMA partners are containing and reducing the infestation. Annually, crews treat roughly 50-100 acres of invasive species in this 1,200+ acre project area, thanks to grant funding and dedicated funding from agencies. Fremont, Lincoln, Natrona, Park, and Teton County Weed and Pest Districts in Wyoming, Bonneville and Teton County Weed Districts in Idaho, Jackson Hole Fire/EMS, Boreal Property Management, Jackson Hole Property Services, Intermountain Aquatics, the Bridger-Teton, Custer Galatian, and Shoshone National Forests, the National Elk Refuge, Yellowstone and Grand Teton National Parks as well as the National Park Service – Northern Rockies Exotic Plant Management Team. The Bureau of Land Management, Wyoming Department of State Lands, Jackson Hole Land Trust, Hanna Outfitting, Gros Ventre River Ranch, Jackson Hole Golf and Tennis, Teton Conservation District and the Rocky Mountain Elk Foundation. The JHWMA was formed in 1998 to establish common long and short-term management policies, goals, and objectives necessary for cooperatively managing and funding noxious weed activities across all jurisdictional boundaries. To learn more about the JHWMA, please visit www.jhwma.org.